Courage comes from within! It can NOT be LEARNED. It can NOT be TAUGHT and it certainly can NOT be BOUGHT! My desire is to open your eyes just wide enough to allow you to see the YOU that God created. Why? Because I am so very convinced that it is this discovery, that will unleash the BOLDNESS, that will allow you to conquer your biggest fears and to live out your wildest dreams. Un Spoken is an witty, brilliant, positive, and relevant voice who plants seeds of hope and enpowerment to the hearers of her spoken words. She is a voice to be reckoned with, she is a word artist who illustrates through spoken words a picture of inspiration. She compels you to think, believe and seek to be the best you, you can be. Had the pleasure of having her host a talent show for incarcerated men during Black History month. She spoke life into them. She was engaging and adapted to the audience. Truly a blessing. 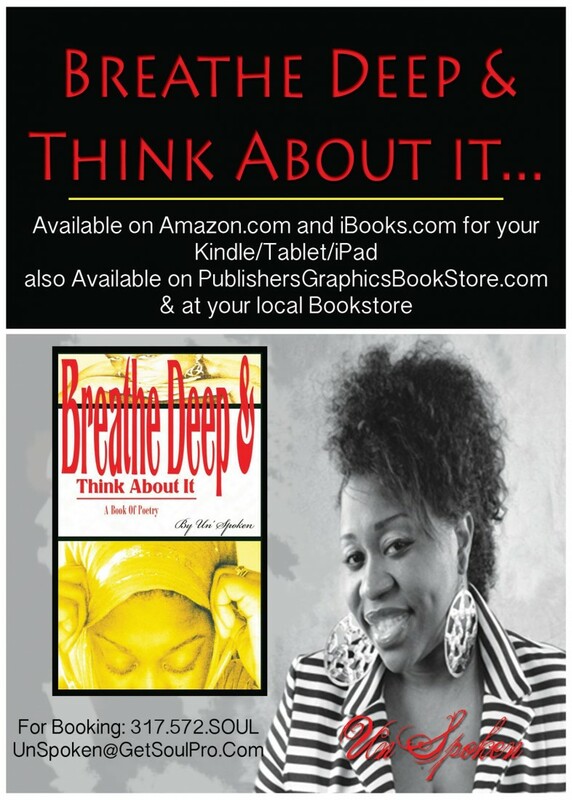 LaTisha "Un'Spoken" Holloway is a talented author, engaging speaker, and beautiful spirit! From the second that I met her, I felt at ease and confident in her ability to deliver an exceptional performance for my 50th Birthday Extravaganza! Her process was detailed and professional. She observed me, my surroundings, and interviewed family and friends to arrive at the "truth" about me. After all, how else could she write and deliver an "authentic" piece that would resonate with and captivate a room of strangers to her? She kicked off the performance with a "jewel" from her vault. After nailing it, she transitioned into her piece for me. Her words lifted me and the room. But, it was her "unique" style of delivery that really made the difference. She was genuine, passionate, and engaging! Although LaTisha only met me once, she spoke like she knew me a lifetime. I think that I get why she's "Un'Spoken." What she doesn't say, yet how she makes you feel is her true gift! Un'Spoken was a vendor at our book signing event that we have annually in Columbus, Ohio. As soon as she spoke; Her words and her story was profound. Her spoken word style captivates you and keeps you on the edge of your seat wanting more! 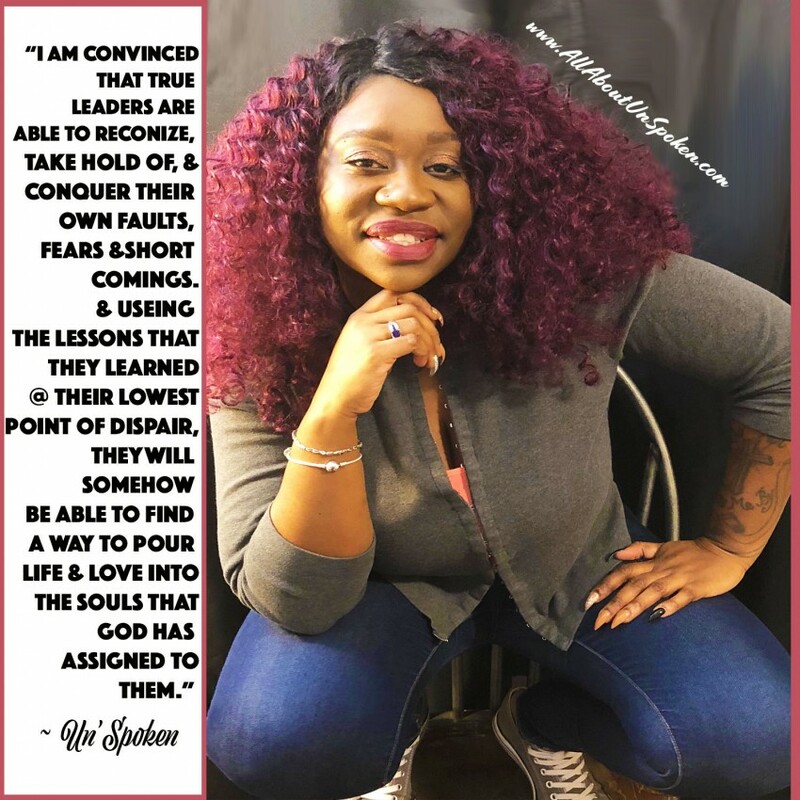 Un'Spoken literally takes you on a journey with her spoken word style, and with her Motivational Speaking style you walk away from the seminar or convention feeling a little lighter, and having a lot more introspect than when you first walked in. My names Gregory James and my experience with Latisha (Un Spoken) has been that of a colleague in the Music and Entertainment Industry, a spiritual big sister, and great friend. For lack of a better calculation it's been years since we've met and connected. From the very beginning of our business relationship she crossed every T and dotted every I making sure things were properly done and ready in a timely manner. My first time working with was at an a event in Chicago she held at "Cafe Lura" which was a popular performance and club space here in Chicago, IL.. At that time she was one of the very few promoters who were trust worthy when doing performance based events in the Chicagoland Area. When I arrived to get things in order she was ready as well as the head of a company should be. We spoke she was very honest, open, stern in her convictions, and ready to roll up her sleeves and work just as hard if not harder than her employees. Needless to say I was impressed. This would continually be the case as we would soon work on two more events together that same year. As a spiritual big sister we continue to speak and give sound counsel to one another on various topics. She expressed because of my work ethic and level of knowledge that aligning myself with a label wouldn't be as beneficial to me as I'm an artist who stands firm in my convictions. They would have to respect that first before anything progress could be made and I strongly agreed. I would also say the same to her when it came down to it as well. As I watched her grow even past that point in time she's surpassed those past glories. She's become quite motivational and inspiring while still maintaining/perfecting that infectious smile of hers. I couldn't be more proud of her right now but I'm sure she'll do even greater things to not just impress but inspire me more than she did our first interaction. Un' Spoken Does it ALL! 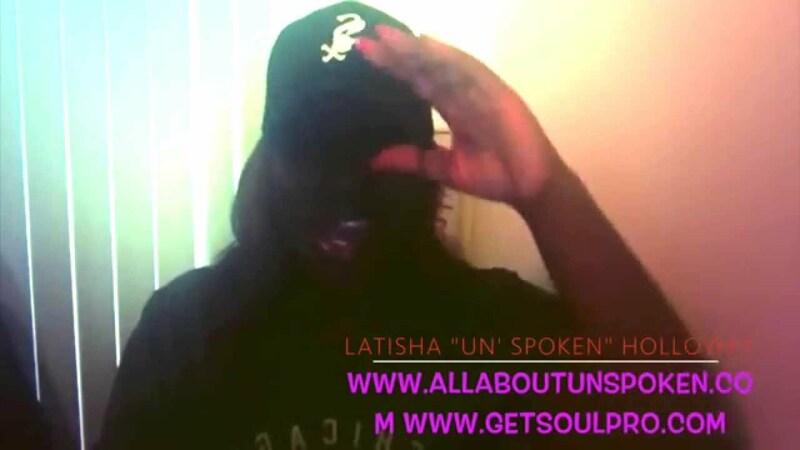 LaTisha Holloway, aka Un' Spoken, was born on the South side of Chicago, Illinois, and planted among the dirt and grim of one of the inner cities' roughest neighborhoods, Englewood. Stricken by the constant struggles of poverty & the deliberate violence from her home front, she often found herself fighting to not choose the temptations of the world. And instead focused on perfecting her pen and finding her voice. Spoken Word became an outlet and a necessity, because it gave Un' Spoken permission to release the frustrations that had settled inside of her. Eventually she began to feel like she had to speak, & began making it her business to speak about everything that everyone else was afraid to take on. Un' Spoken has been the creator of numerous TV and radio shows aired on AOC, WindyCity Underground and World VIBE Radio. She's hosted annual events at the House of Blues & appeared at S.O.L.E Youth Explosions and the Chicago ShoutFest. She has appeared in short films, such as “Book Em”. She’s won countless poetry slams. She’s been the guest speaker & performer at many conference such as, Media Girls Inc & the Pieces of Me Workshop. More even recently, she’s become a 2 time nominee for the Chicago Music Awards, in the category of Best Spoken Word Artist/Poet.